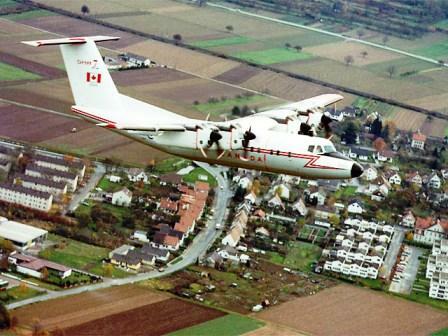 Besides the Twin Otter, the DeHavilland Dash 7 (DHC-7)is one of the few “airliners” for the bush. The Dash 7, while being an excellent airplane, was not an airplane accepted by any market and consequently, only 113 were produced. This is a plane that finished the bush pilot's sentence, "If I ever won the lottery, the first thing I'd get is . . . ." It is a large aircraft for a STOL plane and is capable of carrying 50+ people. The Dash 7 featured four Pratt & Whitney PT-6A turboprops which “blow” the main wing when producing power and enhance STOL performance. The Dash 7 was envisioned by deHavilland as being an airliner for remote areas and also, as being an airplane able to meet lower noise restrictions which were proposed while the plane was being designed. It shares some commonality with deHavilland's Twin Otter, and while some claim it is a four engined version of the Twin Otter, it is very dissimilar from the Twin Otter. The Dash 7 has a relatively complicated wing design with vast flaps, small ailerons and spoilers to augment the weak ailerons. Despite its superior STOL performance, most Dash 7s are used by regional airliners. In this particular application there are many much less complicated twin enigned designs that perform the same job more economically. While being a fine plane for what it was designed to do, the Dash 7 never really found an acceptable number of buyers. But, if the author ever won the lottery. . . . Here is a short video clip of a DeHavilland Dash 7 doing a low flyby at Yellow Knife in the Northwest Territories, Canada. If you've never seen Antarctica, watch this Dash 7 do a flyby in the video below. The landscape is beautiful. For an excellent view of the deHavilland Dash 7 this next video is a can't miss. Its an Air Greenland flight from the inside of the plane and the landscape is amazing. Grab some popcorn first - the video is nearly ten minutes long.